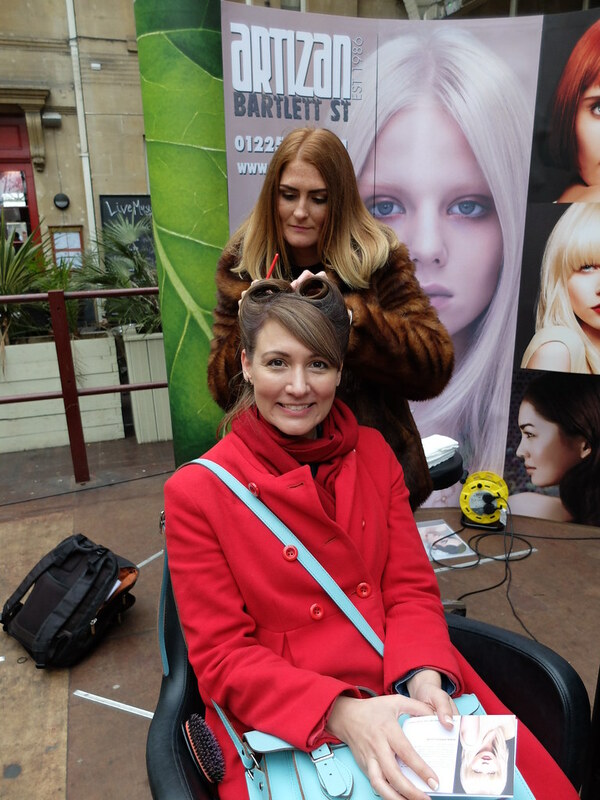 Bath In Fashion is in its 6th year and runs events across the city each March. 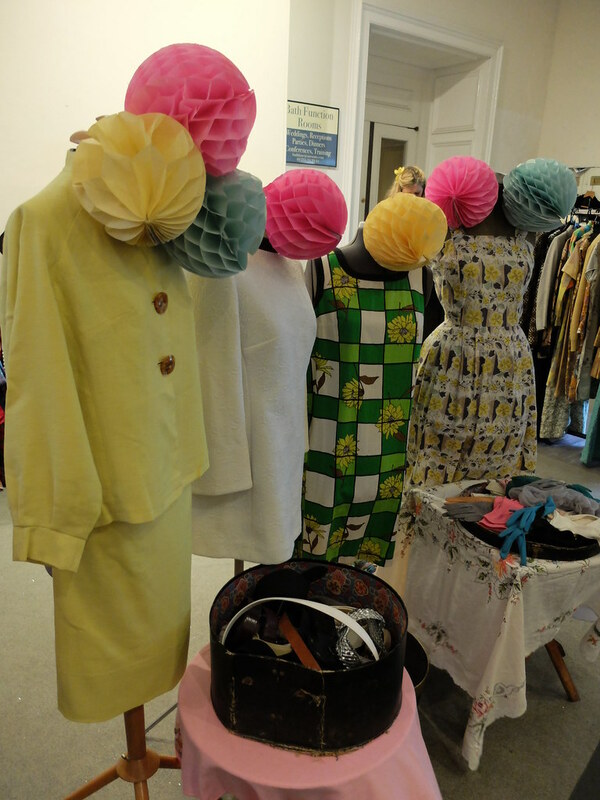 This year, the final day was 'Vintage Sunday', including a vintage fair and talks by authors of books about vintage clothing. I'd received an invite to the talks so thought I'd make a day of it - I knew Catherine from Vintage Frills was going and that Mim from Crinoline Robot was fairly local, so I asked if they both fancied meeting for Sunday lunch. Luckily they said yes! I arrived at the fair with my friend Victoria, both of us wet and windswept but partially restored by a cuppa from a tea house around the corner. 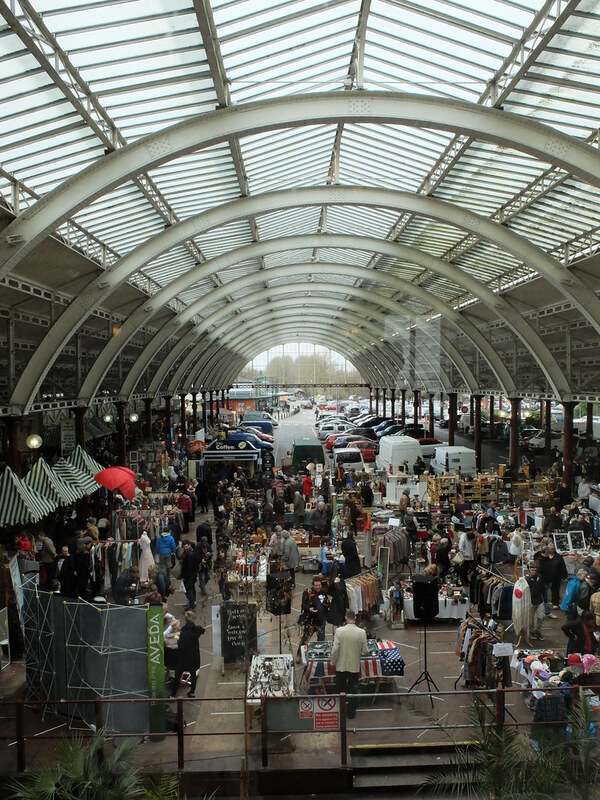 The vintage fair itself was held in Green Park Station, a really super venue that with its huge arched roof sort of feels like you're outdoors but with protection from the elements. 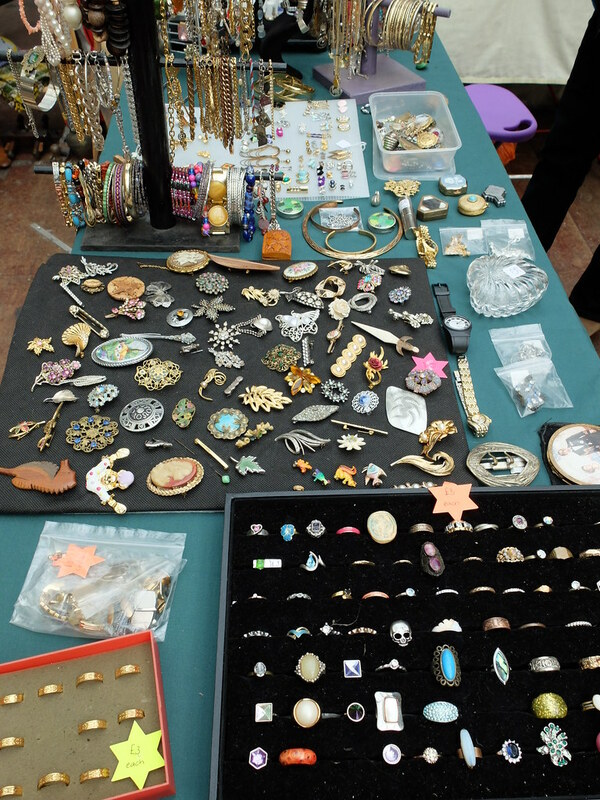 It's a fittingly historic setting for a vintage fair too, as it dates back to the 1860s. 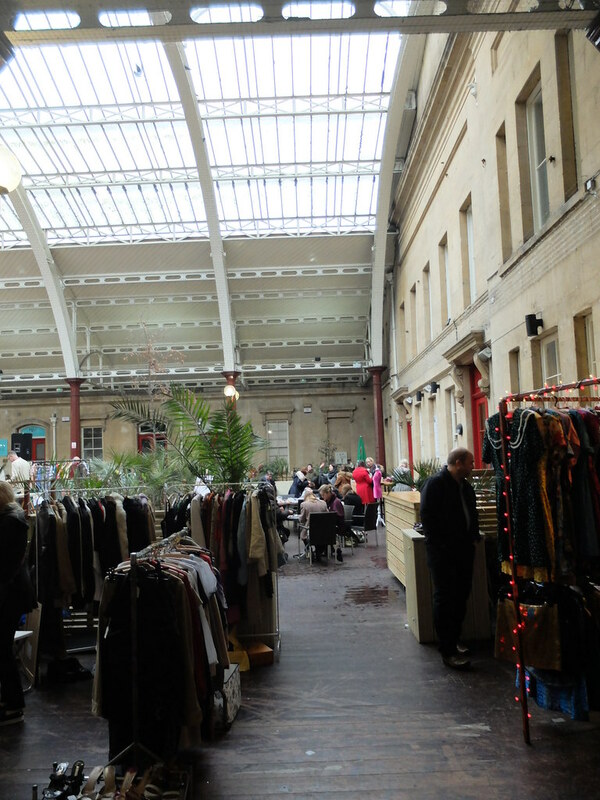 The stalls weren't bad at all, with a selection of older, proper vintage items alongside the usual new but second-hand offerings, and the prices weren't as steep as I'd thought they'd be in an affluent city such as Bath. I spotted a lovely Edward Mann navy floppy hat for £5 in a seller's sale basket, but alas my head was too big. My friend Victoria tried it and it fitted her perfectly, so she snapped it up along with a floral print folk blouse that will go with it well. She'll be rockin' the boho look this Spring! 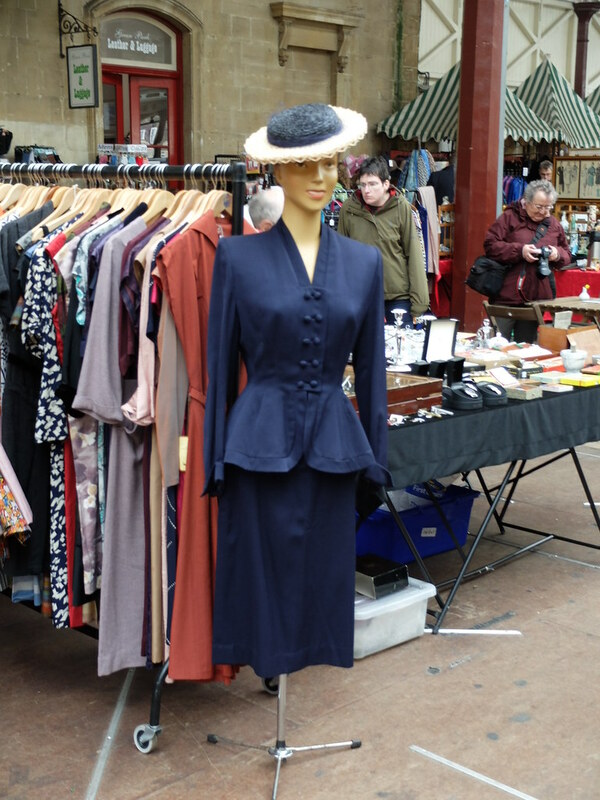 We had a good old rummage waiting for our friend Carol to turn up, and while I was elbow deep in the rails of a particularly fab stall selling '40s and '50s items, I heard a voice and peeped over to see Mim, looking very well turned out in a 1950's shirtdress and velvet jacket. 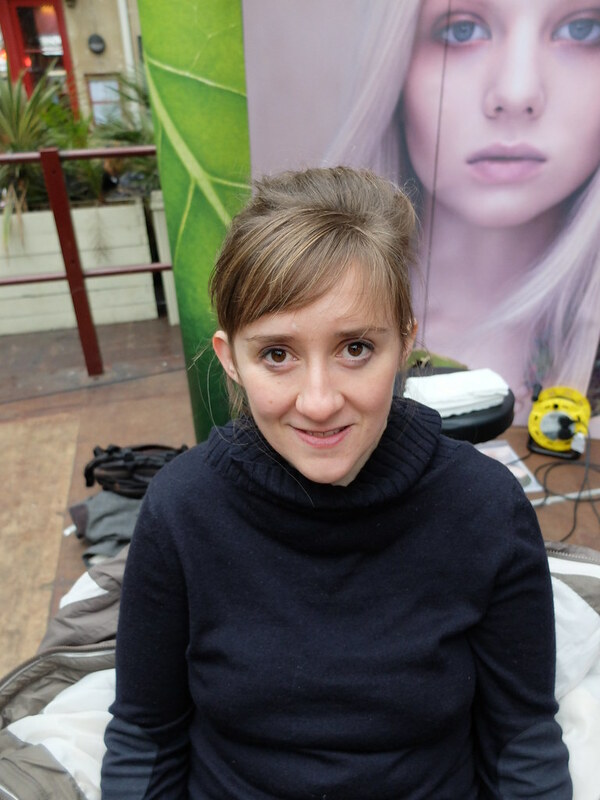 It was lovely to have a chat with her in 'real life' as we roamed around the stalls, she really does have an eye for good pieces and picked up a lovely little black bag for work. Artizan hairdressers were doing hair dos for charity, and both Victoria and Carol had their hair done. I think they both look wonderful! I didn't get my hair done as it was so wet and windy out that I just kept my Bakerboy hat on. 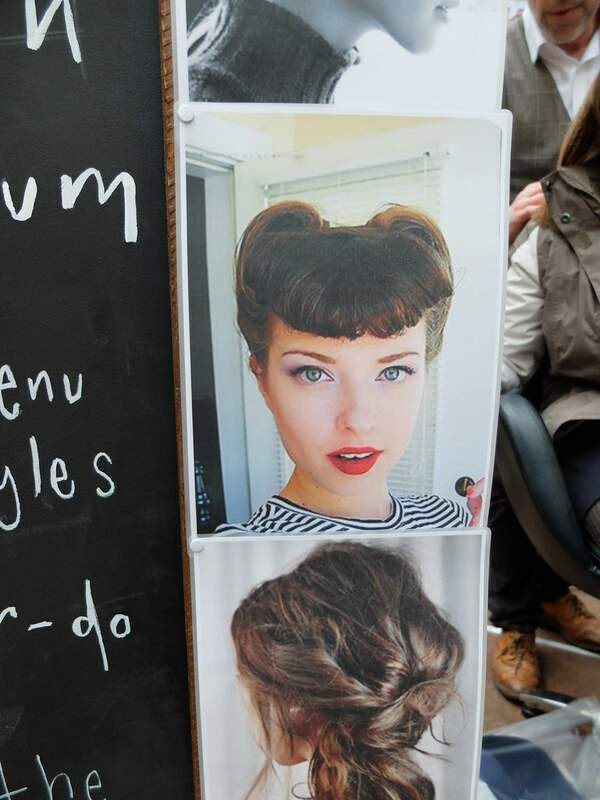 And look who I spotted on the poster - that's Casey from Casey Maura, an American blogger who was one of the first I started following as I got into vintage fashion. She does some great hair tutorials on Youtube, including a few easy-peasy ones for absolute beginners. I found a nice '60s dress that I liked, on the sale rail for £25, but I was uncertain and on going back later I saw that it was a lot more stained than I had first seen, so I left it there. I find buying 'true vintage' really hard, unless it's from the car boot sale cheap-as-chips, it's hard there-and-then to decide whether a dress is worth the cash and you don't necessarily spot condition issues straight away. The four of us adjourned to the pub for a much-needed Sunday lunch, and Catherine met us there looking most smart in an original 1960s dress. We all had a good natter, and time flew as though we were all old friends. Mim and Carol weren't coming to the talks so we said a hasty goodbye and rushed over to the Bath Funcion Rooms, above Green Park Station. The first talk was by Nicky Albrechtsen, author of Vintage Fashion Complete. Her main interest seems to be prints and unusual details, and I was quite surprised that she was dressed head-to-toe in neutrals herself, in the kind of look that I assumed she'd bought from Mint Velvet or Hush. It turned out her beige coat was a 1950s one though! It just shows how much a vintage piece can blend into a look overall. She talked about rescuing 1930s dresses from dustbins, Marilyn Monroe's peek-a-boo bra (that Nicky was loaned to photograph for the book), and the beauty and value in a piece of clothing on its own, regardless of what era it has come from. 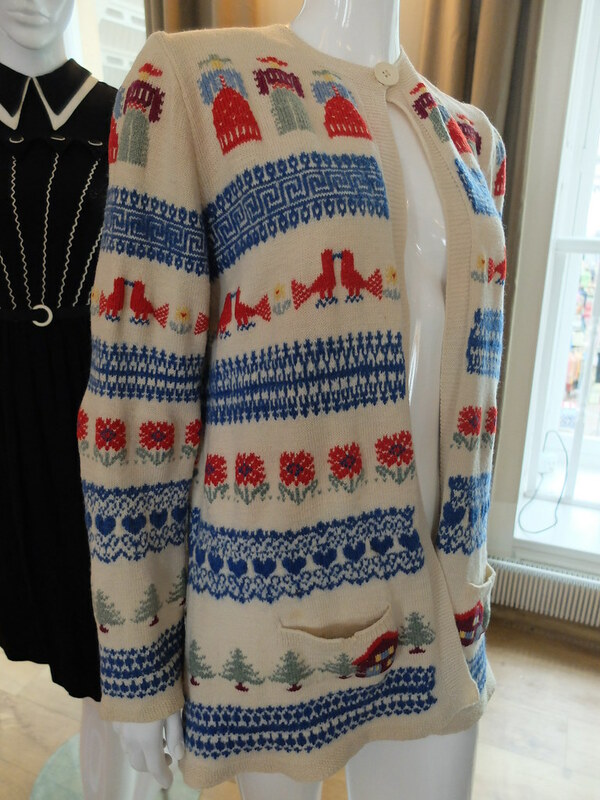 What I also really like is Nicky's passion for everyday vintage clothing, not just all the high-end designer items! The second talk was by William Vintage, author of 25 Dresses. The most captivating speaker, William talked knowledgeably about iconic designer dresses from the 20th century, giving us the historical context of fashion, and what the clothes of each era meant to the women who wore them. His anecdotes were fascinating, as he has literally travelled the world hunting for the best vintage pieces, finding them in Parisian caverns, English barns and Californian mansions. The questions for William came thick and fast after his talk, so it seems that everyone else was just as intrigued and thirsty for more as I was. After those two talks, I don't think I'll ever look at a vintage piece in the same way again - on one level I'll be judging pattern and detail and trying to value it in its own right, and on another level I'll be imagining the social implications of wearing it, such as the 'flapper' being liberated to be able to dress - and undress - herself without a maid. 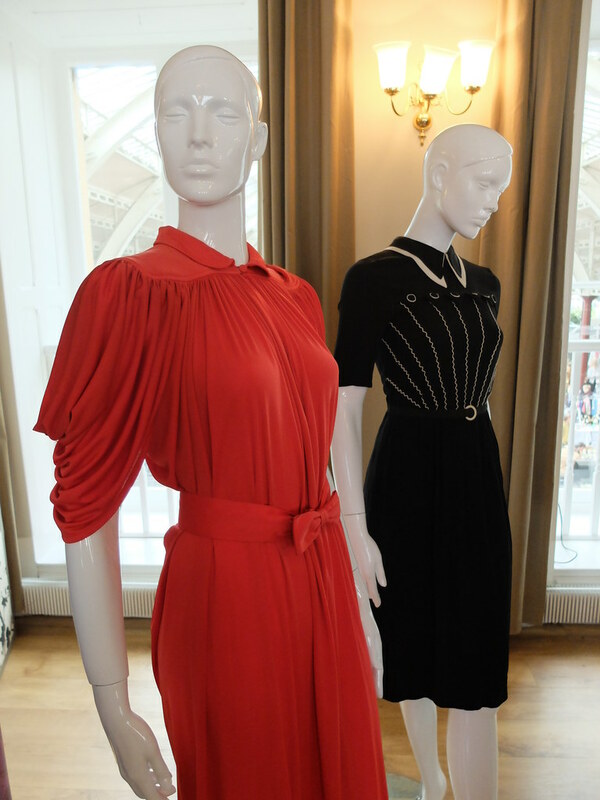 If you do get a chance to go to Bath In Fashion next year I'd highly recommend it. I know if you're travelling from afar that accommodation in Bath can be expensive (£100+ a night unless you book in advance and get one of the Travelodges for £60ish), but you can stay in a town nearby for cheaper and get the train in for a couple of quid and within 10 to 20 minutes. There's so much to do in Bath - I'd recommend a trip to both The American Museum and the Fashion Museum. Anyway, it was a super day to end a busy weekend for me as I covered at least 200 miles on my various visits, but I enjoyed a hot bath and glass of wine at the end of it and was restored. I'm sorry I didn't get any pictures of myself with Mim and Catherine, but I honestly don't know where time went! We'll just have to meet up again. Have you ever been to Bath In Fashion? Do you have a fashion week locally? Monday 25th May there's an extravaganza! Next time I'm definitely in, those talks sound amazing, I'm sorry to have missed it now. Sounds like a great event and so fun to meet up with other bloggers! Those talks sound interesting and I would love to walk around and look at the vintage clothing and jewelry! It sounds like a great day, glad you managed to meet up with Mim. Did you point out the issues with that dress to the seller? You may well have managed a decent discount and I've yet to come across a satin I couldn't remove. You're probably a pro at stain removal! I've not always had success in the past so I'm a bit more wary these days. I used to like Oxiclean but you could only get it in the UK in Lakeland and they've stopped selling it now. Have you ever done a post on stain removal? I'd love to know your tips!! This looks like it was fun and interesting. I was dying over that red jumpsuit (or dress?) and black and white dress. ooh, this looks like my kind of place!! Must visit if I ever get across the pond! You've started something now, bloggers will be meeting up in droves!! This sounds like my dream weekend! I really wish I lived in England, posts like this make me even more eager to figure out a way over there. As far as I know, I am the only vintage blogger in Colorado, it would be so great to be able to meet up with fellow vintage lovers. That photo of the navy suit stopped me in my scrolling tracks, what a gorgeous suit! I want one! Now this looks like an amazing day! Oh wow, what a small world to see Casey's picture on that poster (I do hope she asked Casey's permission to use it). This looks like such a fun event! Plus, I must admit, I was studying the photos of the different booths and displays with great intensity, as I plan on selling at (at least) a couple of vintage/antique/classic car events this year and need all the inspiration I can get for setting up my tables in an eye-catching way. I'm envious of all these great events you find and get to attend! And I love that when you showed up "wet and windswept" you were able to be "partially restored by a cuppa from a tea house around the corner" <3 Sounds like the best way to be restored on a wet day!